For Christmas my wife gave me a portable photo booth, and I finally got around to setting it up. It folds up in to a portfolio bag, and seems like it will be really useful. 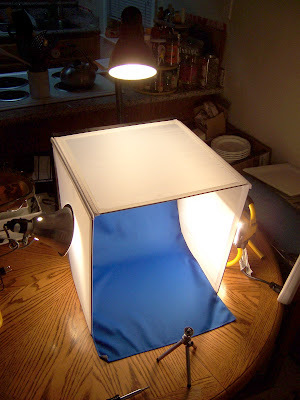 She also gave me two 250 watt halogen lights to blast the miniatures with photons. Unfortunately, they have 6" cords, so I was only able to use one this time. I will have to get a short extension cord to use both. Using this set up, I was able to take some new pictures of two Dirtside II forces. 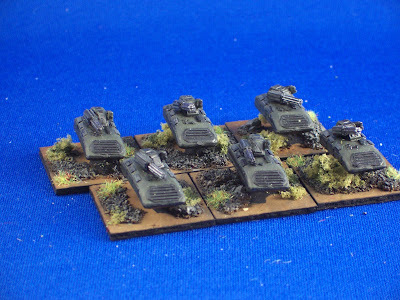 The first is the "Asiatic Combine" army, a high tech force using mostly grav tanks and with stealth upgrades. 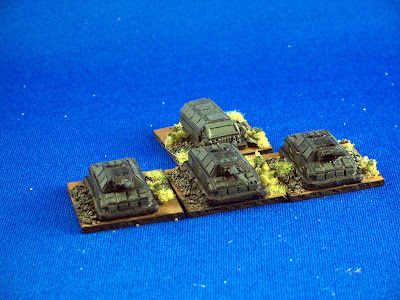 Pictured are an artillery battery, battalion command platoon, two tank platoons, and a company of mobile infantry. 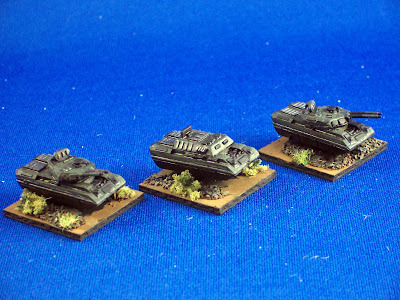 Well, their AFVs anyway, the infantry are still not painted. The miniatures are various Brigade Miniatures, which I really like... after cleaning them up a bit. I also took pictures of my Germanic force, which features more primitive vehicles, this time from CnC and GHQ. 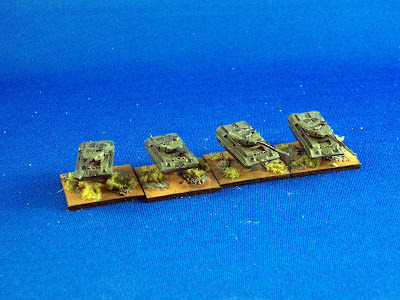 Pictured are an assault gun platoon, a tank platoon, and a command platoon. 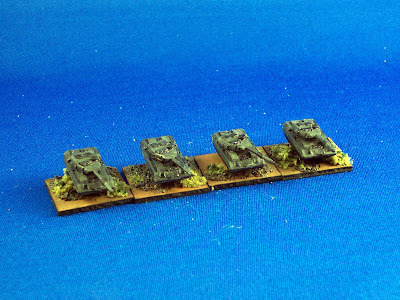 The camo here is an assault camo from WWII, which I think ties these tanks in with the dunklegelb of the other units. 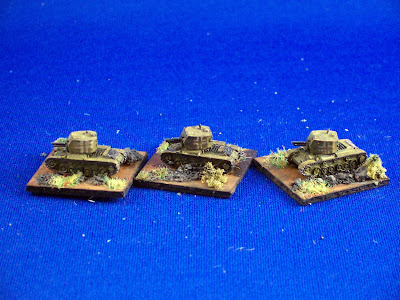 I still have another platoon of tanks to paint, and a platoon of heavy tanks as well. Next to paint are my Americana forces, which are air cushion tanks. I think those are going to wait until after the move though, as I am currently trying to finish off the Neo-Soviets and spearman regiment cluttering up my desk before packing everything up. So it will be a while, but more DSII in the future! Inspired by this excellent conversion at Fawcett Avenue Conscripts, I have been contemplating a similar conversion to support my own Neo-Soviets. My plan is to produce a similar vehicle from a 1/48 Testors Gee Bee model, which is quite cheap here in the US ($7 or so). By removing the engine, rudder, landing gear, and adding a rocket nozzle, turbine intake and gun ports, it should be an excellent little ground attack fighter for defending the motherland. I would cut back the under tail portion of the model to accommodate the nozzle, and extend the tail with a sensor mast. I believe that it should be equipped with an under wing rack of rockets like a WWII Corsair, which may have to be created instead of sourced from another kit. Adding modern triangular antenna projections should also help to make the model look "new" vs. just a rocket powered turbine plane. Colors would be grey blue under with a green upper, stepped when they contact in the tail, and of course, red stars on the side and tail. A suitably patriotic slogan would be great too, something about "crush the Germans" or similar. No stars on the wings, as apparently the VVS did not do that. So another future project, this one for which I have no models... excellent! A slight slowdown in my miniatures work lately due to various non-hobby related business. 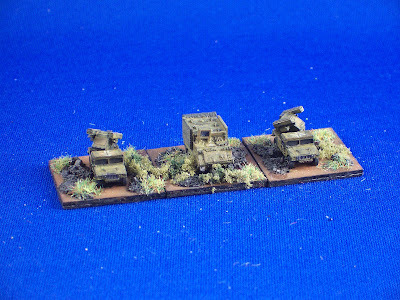 I have painted all of my Asian Combine DSII forces, pictures of which I hope to take and post soon. 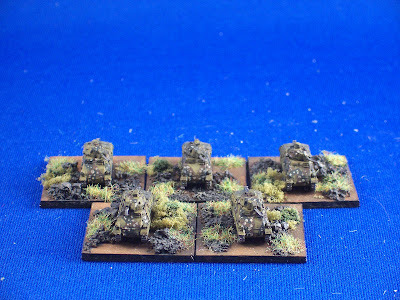 I have also puttered around a bit with the Neo-Soviets I got from Copplestone Castings in January. I am trying to figure out how to do a winter camo scheme on their jacket, and will probably attempt a snow base for the first time as well. Pictures of that will be forthcoming as well. Here is a comparison picture of the Neo-Soviets with a number of GW figures. From right to left: IG steel Legion, IG Valhallan, Copplestone Neo-Soviet, plastic Cadian, and a plastic Catachan. As you can see the Neo-Soviet matches well in size and heft with the GW metals, particularly if the integral base is removed. Wish they were slottas. On the plus side, in a few months I should have a game room and miniatures room as well, so expect some posts about the new space, and planning for a proper games table.